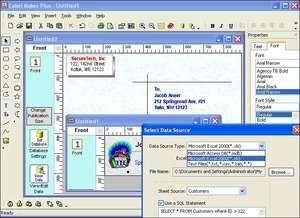 Indentsoft Label Maker Plus is a professional quality business printing software. It helps you design and print full color address labels, letterheads, flyers, postcards, envelopes etc. from many supplied templates using graphics, shapes and color blends. Key benefits - 1) Link to your data from Microsoft Access, Excel, delimited text files. Label Maker Pro 2.2 is a shareware program and can be used as a demo to try the software until the free trial period has ended. A full version of the program is available after the trial period ends. For security reasons, you should also check out the Label Maker Pro download at LO4D.com which includes virus and malware tests. Additional screenshots of this application download may be available, too.